#Evol2012: Competitive flowers, bleached lizards, burrowing mice, and robust invaders « Nothing in Biology Makes Sense! Nathan Muchhala examined floral divergence within communities of Iochroma, a relatively small genus of flowering shrubs from the Andes. Muchhala hypothesized that competition for pollinators would explain the diversity of flower color and shape in different Iochroma species—if nearby flowers of different species attract the same polliantor, they risk recieving pollen from the wrong donor. 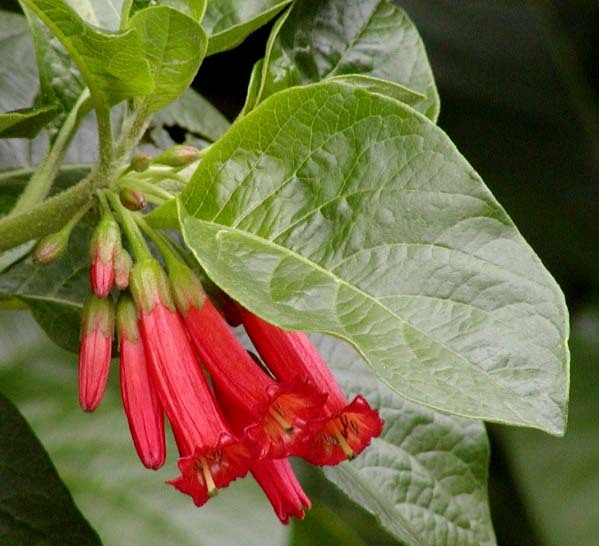 He found that Iochroma species growing together were no more distantly related than expected by chance, but they did differ in color more than expected, which suggests exactly tthe kind of selection he expected. 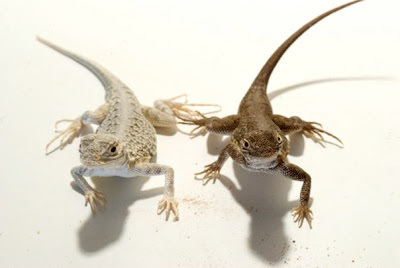 Friend of the blog Simone Des Roches presented results from ongoing field work—she arrived in Ottawa almost directly from New Mexico, where she studies several species of lizards that have evolved lighter coloration after colonizing an expanse of white gypsum sand dunes. Simone’s currently using mark-recapture methods to watch selection for lighter color in real time, seeing whether lizards caught at the beginning of the sumer field season are more likely to be recaptured at the end of the season if their color blends into the sandy background better—and her preliminary data seem to show that trend. Hillery Metz showed that the shape of deer mouse burrows may be determined by just a few genes. She’s bred hybrids between Peromyscus maniculatus, which digs simple, shallow burrows, and Peromyscus polionotus, which digs deep burrows with carefully-dug escape tunnels. First-generation hybrids dig burrows like P. polionotus, which suggests that the differences in burrow architecture are due to dominant genes; later hybrids which have been back-crossed to P. maniculatus dig burrows with a continuous range of lengths, and with or without escape tunnels. Gina Quiram demonstrated that beetles introduced as biocontrol agents for the invasive weed Lythrum salicaria have had the opposite effect intended, thanks to the plant’s evolutionary response: populations of L. salicaria with historically higher concentrations of the bio-control beetles have evolved to tolerate the beetles and to be more competitive against native cattails. Oops. This entry was posted in conference, Evolution2012, genetics, invasive species and tagged competition, hybrid zone, predator-prey interactions. ← #Evol2012 Nothing in biology makes sense, except in the light of good models.